Apr 12, 2014 CRAZE v2 by Driven Sports is Out! Feeling Risky Today? The long awaited Craze 2.0 is here! On this page, you can compare prices and see where it's in stock. There's a lot of backstory to this one, and it's best to be fully educated before taking the plunge. The best way to learn is to read the background on our blog's Craze V2 post, which cites the sources you should read (regarding the first version of Craze) so that you can decide if this is right for you! It's time to get aggressive with your workout with Craze v2! Driven Sports has reformulated its original lineup to deliver cutting-edge results with this new formula. 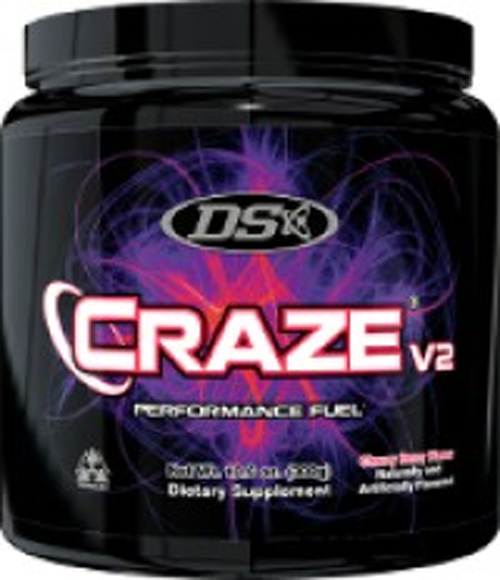 Craze v2 enhances pump, strength, energy, and focus to help you destroy your workout. It also includes ingredients to aid fat loss, so you can achieve your body composition goals. Craze v2 includes Creatine Monohydrate to aid strength during strenuous workouts. It supports the body's capacity to operate during intense activity. As a result, creatine enhances not only strength, but also mass gains. A study involving athletes found that it promotes muscle volume and anaerobic performance. By promoting muscle volume, creatine in Craze v2 may help activate protein synthesis to aid muscle growth. Craze v2 enhances performance with Trimethylglycine, also called Betaine Anhydrous. Betaine supports performance by helping to counteract the effects of lactate to postpone muscular fatigue. As a result, it promotes endurance during intense training. Research suggests that betaine aids strength and muscle gain. In a study, athletes that were administered betaine exhibited a 25% increase in muscle strength while muscle power increased by 20%. Craze v2 ensures you achieve that optimal pump while you train with L-Citrulline. According to studies, citrulline elevates arginine levels in the body more efficiently than arginine supplements. By elevating argininine levels, it promotes nitric oxide production to help intensify pump and vascularity. Citrulline helps to decrease lactic acid. Research suggests it combats the burning sensation correlated with lactic acid build up to aid performance. If you're going to crush your workout, you need intense energy. 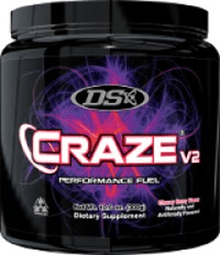 Craze v2 delivers an energy boost with Caffeine Anhydrous. Caffeine promotes alertness by energizing the central nervous system. It combats fatigue to enhance your workout. Craze v2 also supports improved fat loss with Greater Galangal Extract. Research on Galangal suggests that it may impede fatty acid synthase, an enzyme that aids the production of fatty acids. By inhibiting fatty acid synthase, Galangal supports fatty acid oxidation. Green Coffee Bean Extract in Craze v2 also promotes fatty acid oxidation. Research suggests it helps to decrease body fat as well as weight. The active ingredient in Green Coffee Bean is Chlorogenic Acid. Chlorogenic Acid acts as an agonist of Peroxisome proliferator-activated receptor alpha, which plays a major role in regulating lipid metabolism in the liver. Chlorogenic Acid promotes thermogenesis. If your head's not in the game, you won't conquer your workout. Craze v2 contains ingredients to promote improved mental performance. L-Tyrosine and Velvet Bean enhance your drive and concentration. L-Tyrosine and L-Dopa, found in Velvet Bean, act as precursors to the neurotransmitter dopamine, which is known as the "reward center" of the brain. Tyrosine and Velvet Bean help to keep you motivated, so you can accomplish your training goals. Choline Bitartrate is a precursor to the neurotransmitter acetylcholine, which plays a significant role in memory. By elevating acetylcholine, choline bitartrate supports mental clarity and cognition. Little clubmoss promotes concentration and memory. Craze v2 contains an innovative combination of ingredients to support improved performance, strength, and muscle growth. It also ensures enhanced fat loss as well as superior brain function. Experience a pre-workout revolution with Craze v2!